Amongst the olive tree terraces in the village of Moustiers Ste Marie in Provence, France, a wildflower mixture grows, but the red poppies are the prominent flowers. Across the landscape in the village of Moustiers Ste Marie in Provence, France, an assortment of wildflowers blossom in the olive tree terraces. Each wildflower has its own unique coloring, shape and size, but the poppies are always the ones which can easily be seen across the miles of landscape due to their bright coloring.On some days, the wind gently moves in across the olive tree terraces and the tall display of poppies flow back and forth. 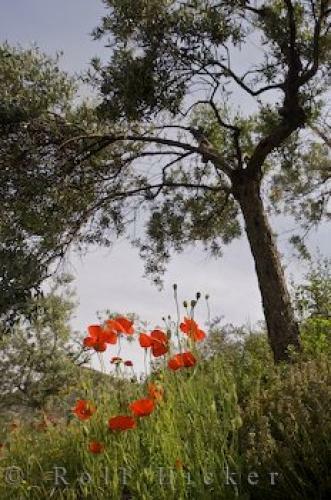 It almost appears that the poppies are dancing amongst the vegetation with the olive trees towering above. terraces in a village in Provence, France.